Over the past few months, a new term has entered the Canadian discourse. Once, “carding” meant a penalty on the soccer pitch, but now it has become synonymous with a broken policing system which sees black people disproportionately targeted by police without due cause. Within this discussion, Desmond Cole’s heartbreaking piece has become the central story. The question of carding has become part of the broader discussion of what police should and should not be allowed to do in this increasingly paranoid world. I do not believe that this heightened level of security and suspicion is warranted, but as demonstrated by the increasing militarization of police, somebody certainly wants me to think it is. While the black community certainly bears the brunt of this flexing of police muscle, other groups also feel it. Including railfans. Railfanning is not well known in car-loving North America. People openly obsessed with trains and all aspects of the railway system seem much more likely to come from Britain, the undisputed capital of the hobby. Sociologist Ian Carter has estimated that between three and five million people in the UK (that’s nearly 8% of the population) could be considered railfans, rail enthusiasts, trainspotters, or whatever title they choose. [Ian Carter, British Railway Enthusiasm (Manchester: Manchester University Press, 2008) p. 1] There are no comparable statistics for North America, but based on magazine subscriptions and internet traffic, a conservative estimate would be hundreds of thousands, if not millions, of fans. I have been a railfan for longer than I can remember. I have always loved trains. After I was born, I went home on a train. I can remember the excitement of riding on the GO train to visit my father’s office in downtown Toronto when I was about four. Back at home, my mother made me a cardboard mock-up of the train which I played with for hours. Some evenings, after my father returned from work, he and I would go down to the local level crossing for a few hours to watch the VIA trains speed past and the long freight trains rumble by. While most boys grow out of their love of trains, I never did, and have continued to be a devout railfan. Over the years, my interest has expanded into writing, photography, academic study and the world of model trains. Such dedication, however, comes at a cost. But then it happened again. On August 21, 2007, the OPP stopped me while I was taking photos from an overpass overlooking the tracks. Same questions, although this officer had never heard of railfanning. I asked him, “is there a legal issue here?” He said there wasn’t. I largely brushed off this second incident too. As I became more proficient in my railway photography, I began to go trackside more often. I never trespass and always take photos from public vantage points. The more time I spent near the tracks, the more often police (not just CN and OPP, but the local police department as well) began to ask me questions. Since the first incident in 2007, I have been stopped about a dozen times. Compared to some members of the black community, this is nothing, but should it have happened at all? In every case, up to the most recent incident, a simple “I’m taking photos of trains” has satisfied the police’s curiosity. A quick search of YouTube for “railfan police” shows that, compared to some incidents across North America, I have been fortunate in my experience. Back in 2010, the editor of Railfan & Railroad magazine was detained by the NYPD for taking photos on a subway platform. Between 2010 and 2014, I spent most of my time in the UK pursuing my studies, only returning to Canada for holidays. On the whole, I enjoyed life in the most surveilled society on earth (where there are nearly 2 million security cameras), even if I found the level of security excessive. The British government’s controversial ‘stop and search’ provisions targeted photographers, leading to the “I’m a Photographer, Not a Terrorist” campaign. In a country where the transport system has been the recent target of terrorist activity, I expected the police to be all over my railway photography. Despite spending hours taking photos at stations and trackside vantage points, the police never once approached me, even though units of up to a dozen officers patrolled the platforms. During my time in the UK, the VIA bomb plot made headlines in Canada. Two men were accused of plotting to blow up a bridge, which would have sent a VIA passenger train and its occupants plunging to their deaths. According to reports, police initially became suspicious after reports of the men taking photos of trains. During the trial, surveillance showed the two accused (and an undercover FBI agent) walking along a stretch of track east of Toronto, clearly trespassing, as they inspected a bridge. It was a location I had photographed before, but from public property. As the story broke, I sent off a series of letters to railway companies and the media, reminding them of the benefits railfans bring to the security of the railway system. In the UK, the British Transport Police has clearly supported the extra eyes trainspotters provide. In the US, Amtrak and BNSF have adopted similar policies. The Toronto Star actually published my letter. 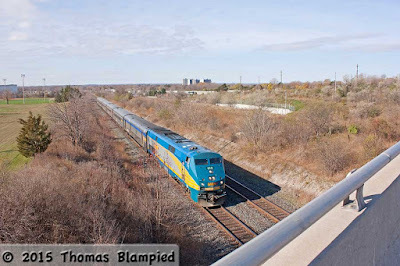 Despite greater scrutiny of Canada’s rail network, I still went trackside whenever I could. My most recent police interactions took place on December 16, 2013 and happened within five minutes of each other. I was back in Canada for Christmas and decided to head trackside to see some trains. After a while, an OPP officer rolled up and quite jovially told me that somebody had so much time on their hands that they had called the police to report me. Satisfied that I was indeed taking photos of trains, he headed off, but not before telling me that he was sure he had seen me before. Once again, I didn’t recognize him at all. Less than five minutes later, the local police pulled up to say that I had been reported. This time, the officer (who was probably younger than I was) asked for ID. I complied and he went to run my details through the databases. It was a cold day as I stood there, wallet open in my hand. I didn’t dare put it back in my pocket in case the officer thought I was reaching for a gun. After a few minutes, the officer returned my ID. Obviously, no flags popped up, and we talked briefly about railfanning, which he had never heard of. He concluded by saying that he couldn’t see how I could avoid being stopped again, and drove away. These last two incidents were over a year and a half ago, yet they still haunt me. Did someone really report me? Who thought that I was a threat? What do police databases say about me now? How could I avoid getting stopped again? The answer to the last one was simple: stop railfanning. I used to go trackside at least once a week if I had the time, but since 2013 I have photographed trains less and less. I choose locations differently, seeking out areas where the police don’t patrol often. When I do go trackside, I spend less time there. I am far more aware of my surroundings and look over my shoulder constantly. In short, I have become a more “suspicious” character, which is surely what the police would have wanted to avoid. Rationally speaking, I have nothing to fear. I am a white, well-dressed, articulate male. My four railway books, my thousands of photographs, my website and even my MA thesis (on model trains) would prove beyond a shadow of a doubt that I am not plotting something and that my interest in trains is completely innocent. Further, last time I checked it was legal to stand on public property. (Both GO Transit and VIA Rail have gone on the record with me to confirm that they do not object to non-commercial photography). However, no amount of rational thought can counteract the emotional stress of handing over my ID to the police and waiting for them to process it, all while countless cars drive by, their occupants trying to guess how many laws I must have broken. In his piece, Desmond Cole spoke about how every police car makes him edgy. I am the same. Even seeing an officer on point duty makes me tense. Cole is right: the more police stop you, the more you start to think you have done something wrong. The more I think I have done something wrong, the more my body language suggests that I have, which then makes me a target. But surely standing near the railway with a big Canon camera strap around your neck isn’t suspicious. Then there is the element of chance. While the police have stopped me about a dozen times, they have also driven right by me dozens more times. There is obviously a fair amount of subjectivity in who the police decide to interact with. I think it is quite understandable that I feel like I have been picked on without good reason. Railfanning, as the police have confirmed to me during my interactions with them, is not a crime in Canada. If I am not breaking the law, why should I expect to be stopped? I’m not sure what the future of railfanning is, but I am cautiously optimistic that the future of policing is going to change. Thanks in large part to Cole’s article and the increasing prevalence of cell phone video, mainstream media are beginning to openly question how the police are allowed to interact with the public. Even the mayor of Toronto has questioned the random stops. It isn’t a crime to be black (at least I hope it isn’t) and no one should be stopped for walking down the street. It isn’t a crime to take photos of trains either. While I realize that there is a difference between the colour of one’s skin and what one chooses to do as a hobby, it is time for the police to recognize that most people are minding their own business. In recent years, police forces have lost the trust and respect of many in the community. Now they must work to rebuild that trust. We must also be ready to discuss how we want our police force (we pay them after all) to conduct themselves. Good post. I haven't had that experience - yet - but it may come. I'm far more cautious in the US than I am in Canada mostly due to less knowledge of their laws vs Canadian laws. Interesting. I think there is still a significant regional issue here. For instance, I have never been stopped while railfanning in Toronto. All of the incidents took place in Durham Region.